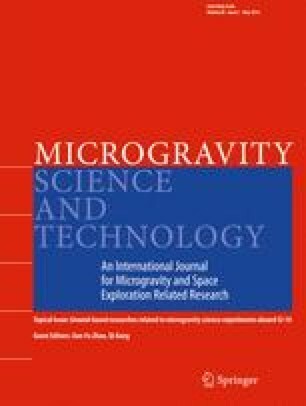 The paper reviewed the previous microgravity experiment using Chinese recovery satellite, the in-situ measurement of composition profile in the solution by X-ray penetration method and homogeneous growth of InGaSb by temperature freezing method under terrestrial condition for making clear the effect of gravity on the growth of InGaSb ternary alloy semiconductor crystals. The previous experimental results showed that the shape of solid/liquid interfaces and composition profile in the solution were significantly affected by gravity. Based on the previous microgravity experimental results, experimental conditions were investigated to grow homogeneous In xGa 1−xSb with higher indium composition at Chinese recovery satellite SJ-10 in near future. We thank Prof. M.Kumagawa, (Shizuoka Univ. ), Prof. A.Hirata (Waseda Univ. ), Prof. N.Imaishi (Kyusyu Univ), S.Yoda (JAXA), and Prof. K.Arafune (University of Hyogo) for the experiment using a Chinese recovery satellite. The part of the work was supported by the cooperative research projects of the Research Institute of Electronics, Shizuoka University.